The Car GuideTests and FeaturesTest Drives2019 Toyota Corolla: Deal or no Deal? 2019 Toyota Corolla: Deal or no Deal? The Corolla is a very enviable position compared to most of its compact-car rivals. Toyota’s popular sedan needs no introduction and could even keep selling well is the company decided to stop advertising it. Its name itself is a symbol of reliability, durability and loyalty. Corolla is also synonymous with the word boring. Also: 2019 Toyota Corolla Hatchback: Excitement Included! Actually, to us car critics, it’s dull because we think that while we’re spending our hard-earned money on a vehicle, why not choose one that’s fun to drive? On the other hand, for the average consumer, those rational qualities mentioned above are all that could matter. However, a new generation of the Toyota Corolla sedan will hit the market for the 2020 model year. It will be built on the same platform as the freshly arrived 2019 Toyota Corolla Hatchback, which we praised for its driving dynamics, style and value. So where does that leave the 2019 Corolla sedan? Should we get one now, or wait for the redesigned model? It all depends on our purchase criteria. And how much of a discount our local Toyota dealer is willing to give us on a 2019. We’re not implying that the current Corolla sedan isn’t a good car, because it truly is. It isn’t the most fuel-efficient model in its segment anymore. When equipped with its automatic transmission, its combined city/highway rating of 7.5 L/100 km is pretty good, but it’s surpassed by the Volkswagen Jetta (7.0 L/100 km), the Honda Civic (7.1), the Kia Forte (6.9) and the Nissan Sentra (7.3). Even the Subaru Impreza with its standard all-wheel drivetrain matches the Corolla sedan’s number. In comparison, the Corolla Hatchback delivers a combined average of 6.7 L/100 km, so the new-generation sedan should be as efficient, or even thriftier. 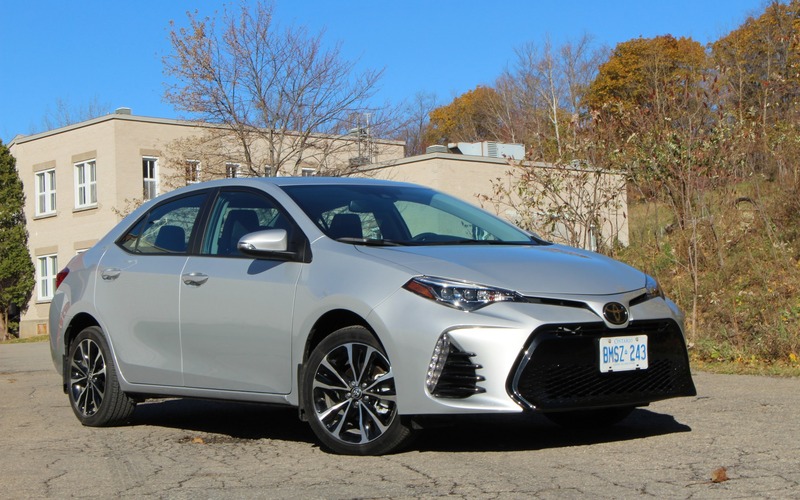 During our test of a 2019 Toyota Corolla XSE sedan, we averaged 7.9 L/100 km. The sedan’s 132-horsepower, 1.8-litre four-cylinder engine definitely won’t get our adrenaline pumping. It will do the job the vast majority of owners will expect of it, and the good thing here is that Toyota is resisting the temptation to take the turbocharged route that some competitors have. This naturally aspirated engine may not be particularly exciting, but it’ll likely remain trouble-free for years and years. Meanwhile, Honda is currently dealing with plumbing issues in Civics equipped with its turbo 1.5-litre engine. In Toyotaland, XSE is the trim level reserved for sportier versions of the brand’s models, but the differences are largely cosmetic. 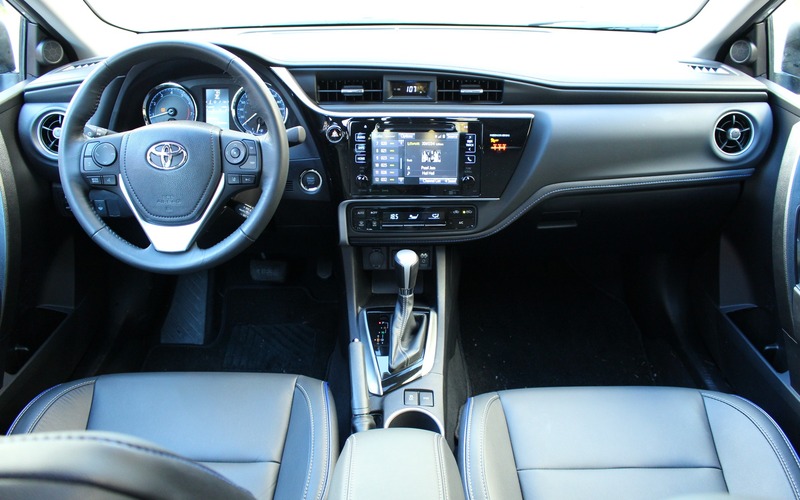 On the Corolla, it’s a package that can be added to the SE grade, but only with the automatic transmission. Truthfully, once we’ve optioned up the SE with the Upgrade Package that includes 17-inch alloy wheels, rear disc brakes, a power sunroof as well as a leather-wrapped and heated steering wheel, the XSE package piles on a seven-inch touchscreen with navigation, SiriusXM radio compatibility, an intelligent key, SofTex leatherette seat upholstery with blue contrast piping and a power driver’s seat. XSE or not, the 2019 Toyota Corolla drives and handles like a low-budget, compact sedan should—nothing more, nothing less. If we’re looking for something more engaging, we should check out the Corolla Hatchback instead, or shop anywhere else—except at Nissan, as the Sentra is just as bland. Ah, but the Corolla compensates with comfortable seats, an uncluttered dashboard and easy-to-use controls. The infotainment system screen is responsive to finger input, but the arrow buttons to scroll up and down menus are hard to poke while the car is in motion. Also, rear-seat legroom is tops in its category on paper, but taller occupants might rub their knees on the front seatbacks. Rated at 369 litres, the sedan’s trunk volume is below average in its category, and after seeing how small the Corolla Hatchback’s cargo area is, we’re not sure the 2020 sedan will be more spacious in that regard. Oh, and there’s no inside grab handle for the trunklid, so we’ll get our hands dirty while closing it during the winter season. The current Corolla is pretty quiet inside, but Toyota is promising even more hushness in the new-generation sedan with additional sound insulation and, well, a stiffer platform. 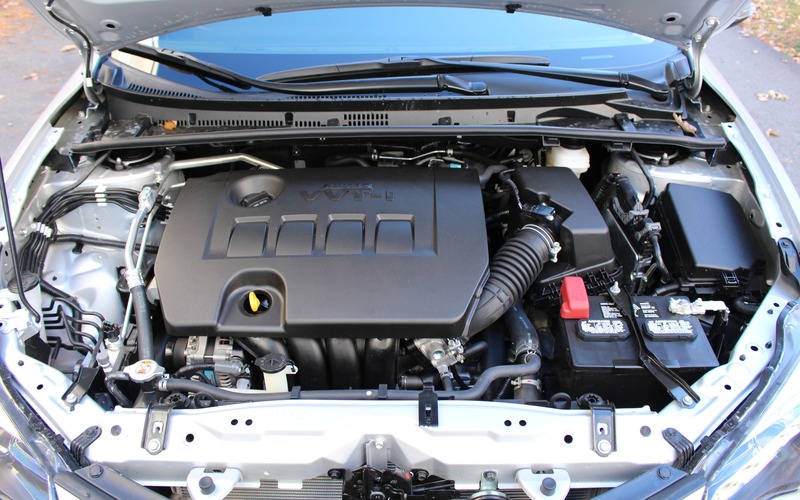 We think the 2019 Toyota Corolla sedan is best enjoyed in the low-cost CE trim level, along with the automatic transmission and air conditioning—the manual gearbox isn’t all that fun to operate. It also includes advanced safety gizmos such as adaptive cruise control, lane departure warning and lane keep assist, forward collision warning with pedestrian detection and emergency braking as well as automatic high beams. The LE grade at $21,210 before freight and delivery charges is also a good deal, with extra features such as climate control, heated front seats, keyless entry, a wiper de-icer and 16-inch wheels. Our XSE tester costs $26K, which is a little steep. For now, the Corolla sedan remains the rational choice in the compact-car segment. It’s the one to buy when reliability, strong resale value and a long-term relationship are the most important aspects we’re looking for. On the other hand, in the spring of 2019, the 2020 Corolla will arrive, and will likely continue to offer all these virtues, in addition to a more engaging drive. But it won’t be offered at a discount or with low interest rates like the current model. A tough decision. 7/10	Several more modern compact sedans are more efficient, but the Corolla remains thrifty on fuel. 8/10	Good seats, at least in the more-expensive trim levels. 6/10	The 1.8-litre engine gets the job done, but has no interest in making the drive engaging. 7/10	Easy to use for the most part, although some on-screen buttons are too small to punch while driving. 4/10	Not a chore, but not fun to drive. 7/10	Without a doubt, the rational choice in the compact-car category.